We are facing an era of rapid change and widespread disruption for the Information technology companies. IT companies are gearing themselves to recruit IT professionals with emerging and next gen skills. Interview Mocha has identified and developed top 10 IT skills assessments that will help you stay ahead of the curve. Information Technology companies deal with a huge data influx. This data contains important insights that is needed for a mission critical system, predict future capacity needs, or simply increase sales by observing and understanding user behavior on your website. Apache Kafka is a distributed streaming platforms that enables companies to create real-time data feeds. With the technology advancements, streaming real-time data feeds without any lags is a given. Kakfa integrates diverse kinds of data such as page clicks, likes, searches, shopping carts, orders, views and feed data in real time into a predictive analytics engine to analyze customer behavior. 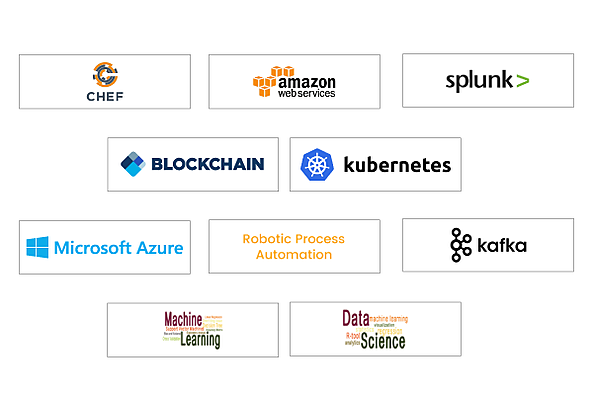 Chef is a powerful automation platform that transforms infrastructure into code. Whether you’re operating in the cloud, on-premises, or in a hybrid environment, Chef automates how infrastructure is configured, deployed, and managed across your network, no matter its size. Chef is steadily making inroads as organizations recognize how it makes IT management easier, more efficient,and flexible. Kubernetes allows to deploy cloud-native applications anywhere and manage them. An open source system for deploying, scaling, and managing containerized applications, Kubernetes handles the work of scheduling containers onto a compute cluster and manages the workloads to ensure they run as the user intended. Data Analytics is simply the way to analyze and use data to gain insights and make better business decisions. Data can come from online sources such as social media, eCommerce sites, and surveys, or from offline and mixed services like CRMs, spreadsheets, in-store customer interactions, focus groups, market research and customer feedback. Data Science and Analytics can give you the capability to make more insightful decisions that are the best for your company.